Chabot with a nice goal from close to the blue line on the PP. him, chlapik and Perron are fast! But you know who's really shinning is Danny Taylor. Som great saves and Belleville has been badly outshot so far! Flo The Action wrote: Chabot with a nice goal from close to the blue line on the PP. I wonder why Taylor is playing back to back games with Hogberg and Hammond available? Well he got chased out as Belleville lost 6-2 but I’ll tell you what, that wasn’t his fault. He played really well but was left to dry by the D. One thing is for sure, Kurt hasn’t implemented the system down there. We were totally outplayed. Montreal was faster, more determined than the sens. Poor showing. Even chabot left a lot to be desired, especially defensively. Is Paul injured? I didn’t see him all game. Paul played in the first game. Haven't heard about any injuries. Could be a healthy scratch, or just an afternoon game on back to back days, with bumps and bruises. One of the lone bright spots in the entire organization right now is Marcus Hogberg. He's only played two games for Belleville so far, but has looked very good, including a 35+ save performance last tnice in a 3-2 shootout win. As I've been saying for years, he's one of our best kept secrets. Nick Paul scored. Gabriel Dumont may have picked his nose. Not confirmed. Colin White is "leading" the team with a -18. Maybe that's one of the reasons he has not been called up. Some 25-year-old "kid" named Murray is apparently impressing as another left-side D-man. He went undrafted, got signed to a PTO out of UNB, then extended for 2 years (AHL contract). Why do we have so few righties? Karlsson-Ceci-Wideman-Jaros. That's it. When they move Ceci and move on from Wideman they will be forced to hang on to Phaneuf since he's comfortable on the right. I realize this is why they are playing Chabot on the right but longer-term I'd still prefer him on his natural side, other than the powerplay. wprager wrote: Useless stat alert! They were. But regardless of whether they are doing it now or not, we have 2 healthy righties so a LHD is playing a regular shift on the right. Hogburglar. Hamburglar is now on Minny. 5-0 and that's with Balcers and Wolanin in the pressbox. The Rocket are trash this season. JOB had 2 but those were goals 4 and 5. The winner was Brown on the PP. Edit what's wolanin doing there in the first place? I answered my own question looking it up. That's a surprise. I think they'll try to play Harpur some easy minutes to get some GM to bite on his 6'6" frame. Thing is, Harpur is better than what he's been of late. He skates well for a guy his size, but he's lacking confidence something awful. He should start hitting more, simplify his game by using his size. Brown with 2 more goals as the B-Sens finish a perfect pre-season with a comeback 4-2 win against Team Rocket. 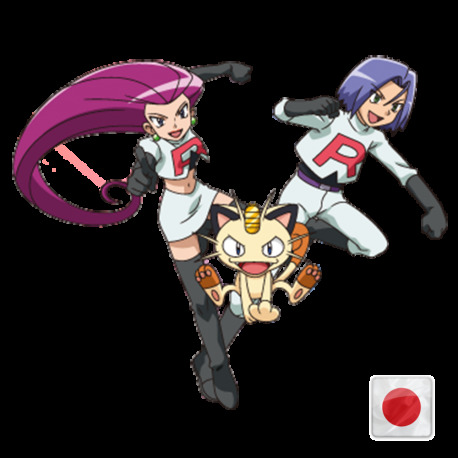 Seriously, how is Meowth not their mascot? In an unforseen turn of event, Luchuk assigned to ECHL.